Peer networks have proven to be an especially powerful tool to deliver conservation at all scales across the vast and dispersed Pacific region—from collaboration among partners on a single island to collaboration across many island nations. Perhaps due to the strong oral traditions of the region, many Pacific leaders actively participate in peer networks to get and give “just-in-time, demand-driven, learning by doing” assistance, along with others who are pursuing similar goals with diverse strengths, skills, and experiences. Based on the value of their peer learning experiences, these leaders often support peer network participation by their staff and partners as well. Every conservation network needs to be designed with and for the people, places, and resources it serves. Depending on the desired purpose, network members can be individuals, organizations, communities, government agencies, sites, and/or protected areas. Regardless of membership, the success of these networks requires common goals, transparency, and healthy self-direction. International partner organizations can play valuable supporting roles, but the members must direct and propel the network to serve their priorities and strengthen their self-reliance over time. The leaders strongly advocate the network approach, which has amplified conservation impacts at local, regional, and global scales. This approach has also proven to work at all levels—from bottom-up with communities and middle-out with conservation organizations and agencies, to top-down with Presidents, Prime Ministers and other elected officials who leverage and expand the efforts through policy and financial incentives. All the leaders were clear that none of the sites is perfectly protected and all face the reality of continuing pressures from growing populations and Earth’s changing climate. Nevertheless, a few inspiring community-based sites in Hawaiʻi, the Solomon Islands, and Micronesia have given rise to a multitude of successes across the planet and are helping to drive action for ocean conservation today. The Locally-Managed Marine Area (LMMA) Network has been a resource and an impetus for conservation across the Asia-Pacific region since the early 2000s. 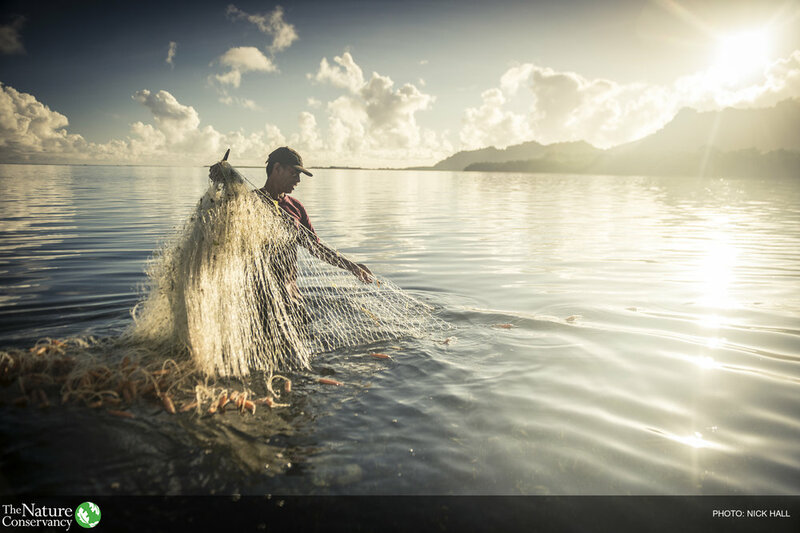 This exemplar network prompted the establishment of networks of Hawaiʻi community groups that are reviving traditional management practices to restore coral reefs, fishponds, and other coastal resources. The Arnavon Community Marine Conservation Area is a testament to one community’s commitment and perseverance. It also stands as a beacon that has inspired more than 50 protected areas across two provinces, a national conservation plan, and the establishment of a tribal network in neighboring Papua New Guinea. The Micronesia Challenge illustrates how collaborative work with communities at a few sites can serve as a strong foundation from which to build an unprecedented regional conservation effort. In launching the Challenge, President Tommy Remengesau reframed the image of these island nations, recognizing their true nature as large oceanic states. The effort transformed island conservation around the world and stands as a powerful example of the periphery influencing the center.